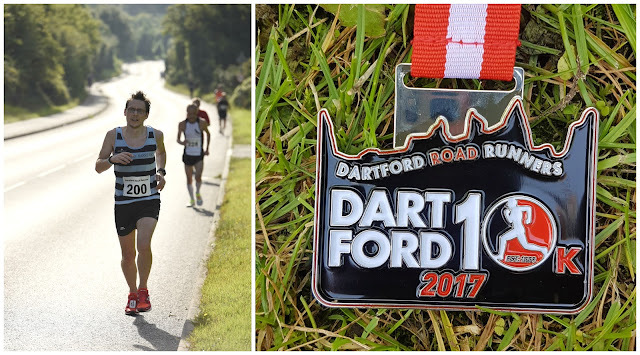 The Dartford 10k is a brand new (as of 2017) August Bank Holiday event hosted by Dartford Road Runners (DRR). 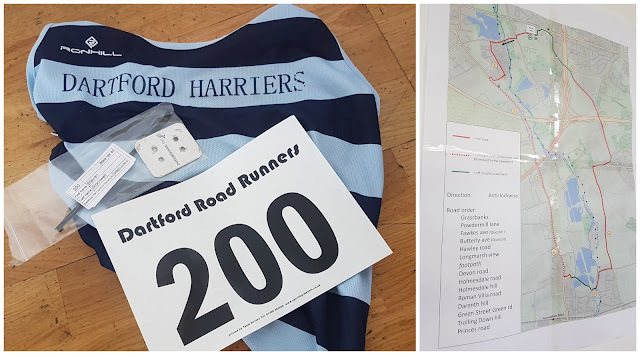 It effectively replaces the Les Witton Dartford 10 Miler which had its last running in 2014 (blog here). DRR are also responsible for the Joydens Wood 5k race series and the Run Dartford race series (my venue guide), so they are well rehearsed and have a reputation for putting on great races. I entered the Dartford 10k a couple of weeks beforehand via the Runbritain online race booking system and paid the affiliated runner price of £15. Non-affiliated runners had an advance entry fee of £17 while on-the-day entries were £20. I received a detailed race instructions email a few days later. 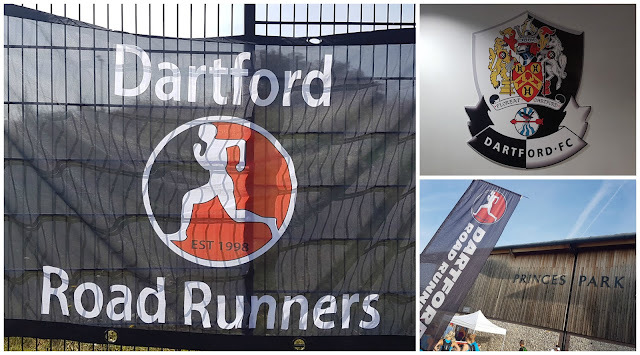 The race headquarters was at the Dartford Football Club stadium, Princes Park, and the venue also has car parking available. Being a football ground, it has toilets as well as post-race refreshments facilities. The race HQ was set up on the first floor inside the main stadium overlooking the football pitch. Race numbers and timing chips were collected on-the-day from the desks at HQ. There was also a bag drop available in this room and once changed I left mine with some of the lovely DRR volunteers. Heading along the football stadium access road the course initially headed downhill where runners had to take care passing over the cobbled speed bumps. A quick left-right took the runners onto Powder Mill Lane where the downhill gets even steeper (-11% at one point). Upon crossing the River Darent, the course hits one of its lowest points and things level out. My pace was already quite fast due to the downhill start and I worked my way through the Questor Industrial Estate in the bright sunshine - it was a beautiful August Bank Holiday Monday, but the heat did make things feel tougher out there. I passed the 1km mark in 3.49. I knew this was a pace I couldn't sustain so I did my best to relax and ease into a more settled pace. Exiting the industrial estate for a 3km stretch along Hawley Road, the course passed under the A2 and M25 motorways and felt totally flat. However after reviewing my GPS data, there was a very gentle incline all the way along this road right up until 4.4 kilometres where the route turned off of the main road and into South Darenth. The gentle incline naturally lead to a gradual slowing of my pace, which was needed. The route through South Darenth took the runners along a residential street before heading into a single file, slightly uneven, alley way path for 500m which runs alongside a lake. Turning back onto the residential streets the course crossed the River Darent again and this roughly marked the halfway point. I crossed 5km in pretty much 21 minutes flat, which is only about 15 seconds slower than my current 5k pace. I had set myself up for a pretty painful second 5k and there were times where I wondered why I continue to put myself through this self-inflicted misery. If there's anything that can be said, it is that this is definitely a race of two halves. The first five kilometres allowed for a quick pace, but the second half contained the some challenging undulations and hills. Straight after crossing the river, the inclines started - first of all along Holmesdale Road which turned into Holmesdale Hill after rounding a bend. Then the course turned onto Roman Villa Road and the first water station was found, I was suffering quite a bit at this point and eased off the gas to take a sip of water before dumping the remainder of the water over my head (I've since decided that pouring water on myself didn't really help - all it did was make my vest heavy and uncomfortable). I'm quite familiar with Roman Villa Road as I quite often cycle along it. It is 1.5km in length and is the most scenic part of the course with lovely views across the Darenth Valley to the left. The heat was still an issue but by staying to the right hand side of the road it was possible to keep in the shade. I kept plugging away along the road's undulations until reaching the end where the incline is a little steeper (roughly 10% gradient). A bit of relief was found at the end of the road as the course swept down the steep decline of Darenth Hill towards Green Street Green which is flat for a short while and due to the high temperatures an additional water station had been set up just as the course passes back under the A2. The flat section gave a little time to mull over the final climb of the day, which was Trolling Down Hill. To be fair the incline here is not very steep (around 3%) but it heads uphill for almost a kilometre. As you'd expect, it felt harder being towards the end of the race, plus there was nowhere to hide from the blazing sunshine. The course eventually crossed over the M25 and reached the end of the road where the runners headed back into the football stadium complex via the Princes Road gate and the finish was found shortly afterwards. After composing myself and letting the urge to vomit pass, I picked up my participation medal and headed over to the water table to start re-hydrating. The design of the medal was pretty cool - the top border matched the hill profile of the course, which I thought was a great idea. 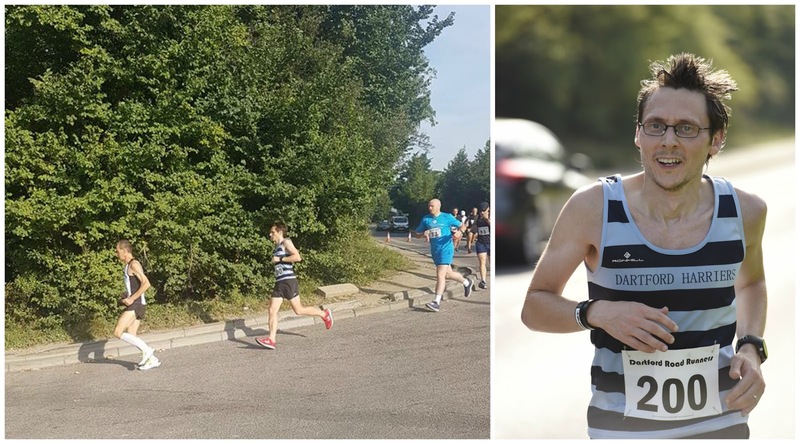 There was no shortage of familiar faces to be found and I spent a fair bit of time chatting to fellow runners and exchanging thoughts about the tough second half of the course. The results were available instantly via two laptops which had been set up for runners to use - I had a quick glance but didn't linger for too long. I collected my belongings from the first floor of the stadium and headed back out onto the road for my short cool-down jog back home. The official results and a great album of official photographs were published a bit later in the day. I also generated the course fly-by with the Relive app and you can view it on youtube, here - Relive: Dartford 10k 2017.